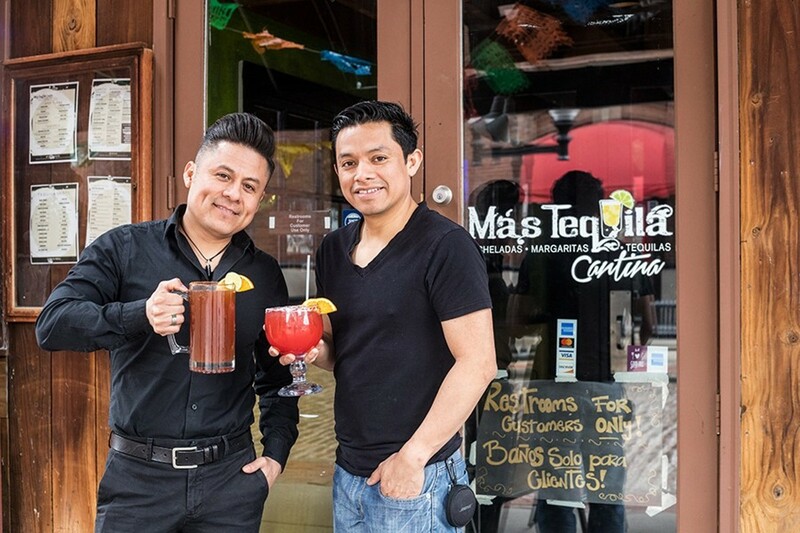 Mas Tequila Cantina co-owners Javier Geminiano and Jesus Jaimes have high hopes for the Landing. 708 North Second Street, 314-877-1700. Monday-Sunday, 11 a.m. to 2 a.m.
710 North Second Street, 314-621-9570. Monday-Sunday, 11 a.m. to 2:30 a.m.
Javier Geminiano sinks into a black wooden chair in the front dining room, catching a three-minute breather from the organized chaos in the back of his restaurant. Though it's a Sunday night, and the streets of Laclede's Landing are desolate, the back room at Geminiano's six-month-old Mas Tequila Cantina is packed with 50-plus conventiongoers. The requests for margaritas and micheladas have been endless, but now that the party has been served its entrees, Geminiano has a moment to reflect. "The Landing is such a great area — it's historic and has wonderful buildings and is such a part of the city," Geminiano says. "It's coming back. We opened here because we want to be a part of bringing it back." 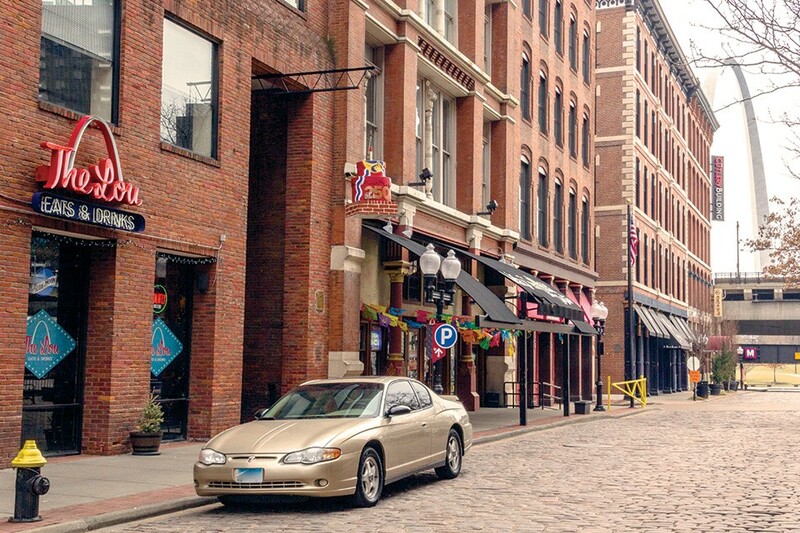 Walk the cobblestone streets of the Landing any given night, however, and you might wonder why Geminiano is so bullish on the area. In its heyday in the 1980s and early 1990s, the city's historic riverfront district was the place to be, a vibrant maze of bars, clubs and restaurants perpetually buzzing with locals and out-of-towners looking for a good time. But time has not been kind to the Landing. The area has a reputation as a ghost town, a tourist trap in need of tourists, and while mainstays like Morgan Street Brewery, Big Daddy's and the Old Spaghetti Factory have hung on, the vacant real estate around them only confirms that image. However, if you stand in front of Mas Tequila's entrance on Second Street, you feel something — a faint glimmer in an area that has been void of light for over a decade. It's not just the colorful flags, beckoning you inside with the promise of tequila-spiked drinks and approachable Tex-Mex food. It's not even the fact that there is a newer restaurant there in the first place. It's the fact that Mas Tequila has neighbors. New neighbors. Completion of the CityArchRiver renovations could mean good things for Laclede's Landing. In the last eighteen months, three restaurants — Mas Tequila Cantina, the Lou Eats & Drinks and, most recently, Kimchi Guys — have all opened up on Second Street, just north of the Landing's MetroLink stop and the reopened Gateway Arch grounds. All three are determined not only to bring back, but to improve upon, what the Landing used to be, turning the area into a bona fide dining, drinking and entertainment destination. For Geminiano, a native of Mexico, the district was nothing but pure, untapped potential when he first saw it. With nearly two decades of hospitality experience in his home country, Geminiano knew he wanted to open a restaurant and bar when he moved to town six years ago, searching everywhere from the Central West End to Washington Avenue for the right spot. Nothing struck him until he walked into the former home of Jake's Steaks on Second Street. With its historic architecture, large size and inexpensive rent, he felt like he was getting a steal and signed on the dotted line immediately. Walking into Mas Tequila Cantina, you'll understand why Geminiano was smitten. The soaring bar area, surrounded by a loft with additional seating, evokes the feeling of a Spanish-style interior courtyard. The room's historic brickwork, wooden beams and wrought-iron details are nothing short of stunning. Interspersed throughout its nooks and crannies are Dia de las Muertos-inspired artwork and vintage photographs of Mexican street scenes. The large wooden bar, backed by a wall containing an impressive tequila selection, takes up one side of the front room. High-top communal tables, and two small nooks with more traditional tables, provide additional seating. 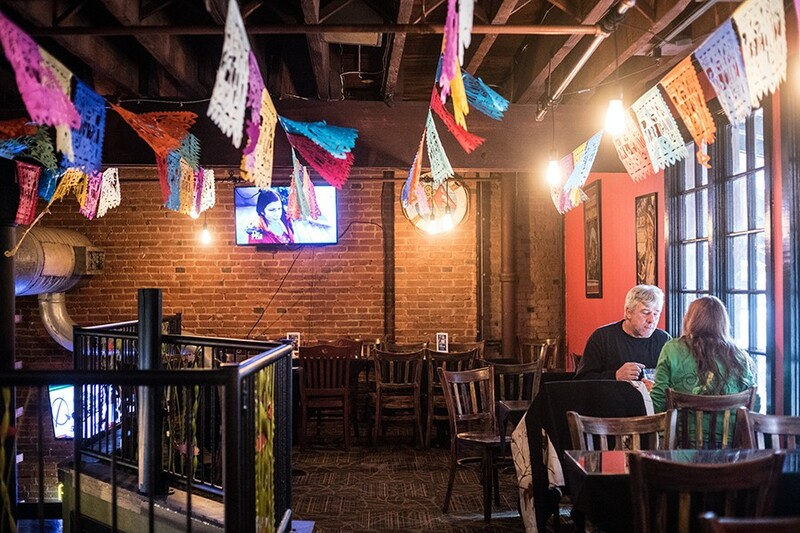 Mas Tequila features a bar area with a soaring ceiling and several cozier nooks for dining. When Geminiano first opened last May, he had ambitious plans for a menu that would showcase authentic Latin cuisine in addition to the fare typical of American-style Mexican restaurants. He's scaled that back and instead relies on a standard playbook that is generally successful for what it is. A chimichanga is the sort of deep-fried, cheese-and-sour-cream-covered indulgence you want when you've chosen the sort of restaurant that serves you margaritas out of a glass the size of a small punch bowl. A platter of enchiladas features four different varieties — cheese, bean, chicken and ground beef — each smothered in smoky red sauce and crema. Both the enchiladas and the chimichanga are simple, but satisfyingly rich and well executed. Geminiano shows more range in his "taqueria" selections. Shrimp tacos are stunning, filled with plump, perfectly cooked shellfish nestled into corn tortillas with red onions, salsa and cilantro. His al pastor version is equally delicious, a juicy mélange of pork and pineapple that hits the right notes of sweet, spice and savory. The pork and fruit flavors are wrapped in warmth from smoky chiles, giving an unexpected dimension of complexity. There are some misses, however. On the sopes and tacos, the steak was flavorless and chewy, while an order of tequila hot wings features paltry chicken pieces and a basic hot sauce, together reminiscent of something you'd find on a complimentary appetizer buffet. The biggest offender, though, was the ceviche, not so much in taste (though it could have used significantly more citrus) as in temperature. Instead of bright, lime-kissed refreshment evoking the seaside, Mas Tequila's ceviche was served somewhere between room temperature and warm. It was off-putting. 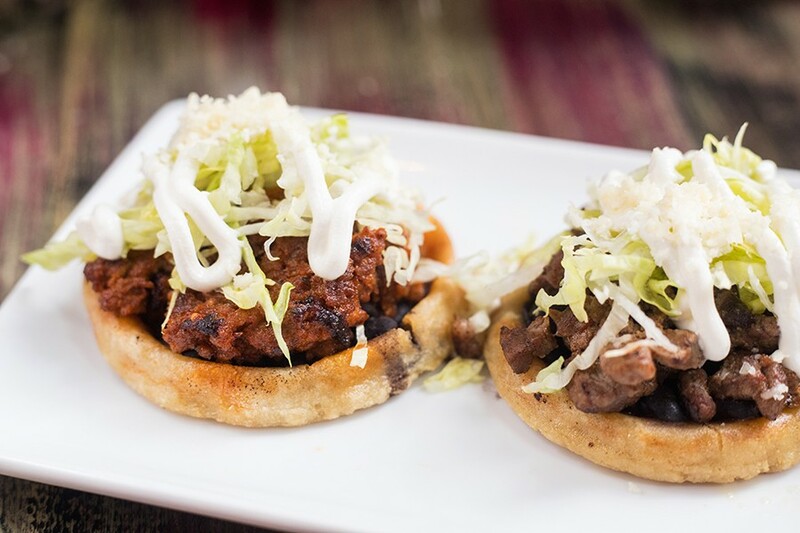 Sopes can be topped with carne asada or al pastor. However, after eating Mas Tequila's housemade pork tamale — which is curiously buried in the menu's a la carte section alongside rice and beans and french fries — you understand the restaurant's promise. The tender masa is filled with hunks of succulent pork, then covered in a deeply earthy, mole-style sauce that is so rich, it's like gravy. 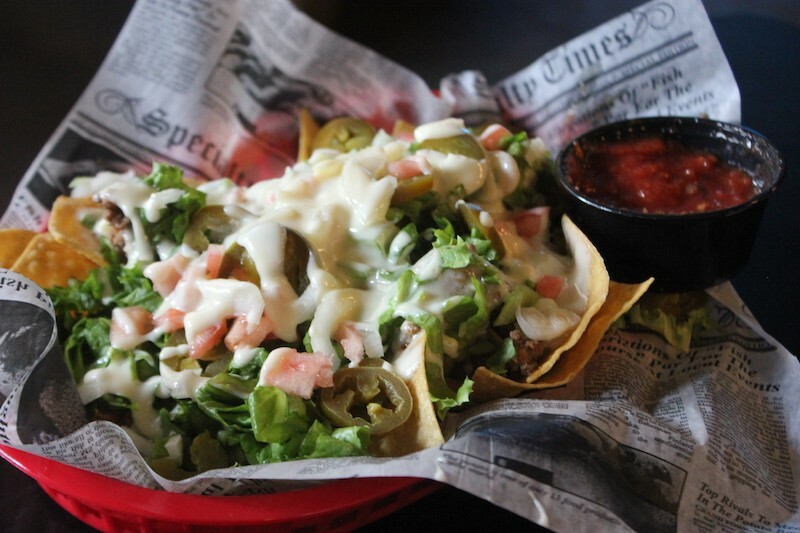 Wash down a platter of these beauties with a "Javi's Premium" margarita, and you'll be so excited about the Landing you might just start browsing for real estate. If Geminiano is able to see the Landing with the unfettered optimism of someone who didn't witness the bad times, his neighbors at the Lou Eats & Drinks are more battle-tested. Though the St. Louis-themed restaurant has only been open in its current form since October 2017, it operated as a location of the popular local Italian chain Joey B's for years before that. 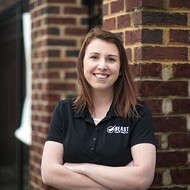 Kendra Willoughby, the Lou's general manager, has worked at the restaurant for four years. That's long before the restaurant rebranded and, critically, includes the time when it felt like the crippling construction project to reunite the Arch grounds with downtown would never end. "It was supposed to take two years, and it took almost five," Willoughby says of the massive CityArchRiver project, which made the Landing almost impossible to access from the Arch grounds. "But it was difficult before construction, too. A lot of bars started closing before that." The Lou has a classic bar feel. The Lou's owner, Paula Zingrich, had been part of the Joey B's team before buying the restaurant. She understood that the Landing was in the midst of a transition, and felt that the restaurant needed to change as well. 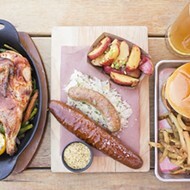 What better place to showcase the unique culinary heritage of St. Louis, she thought, than a part of town filled with tourists eager to experience the local color? Once the renovations were completed, surely there would be throngs of hungry people curious about the city. Out of that idea, the Lou was born in all of its Provel, gooey-butter glory. To that end, the Lou is not haute cuisine, but rather a game of "where did you go to high school" in food form. 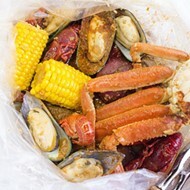 And the restaurant does that capably, serving St. Louis classics like pork steaks and hot salami (with the inexplicable absence of toasted ravioli) the way you'd want them showcased to out-of-towners experiencing them for the first time. An appetizer of Bosco sticks is the sort of carbs-on-fat pleasure you'd use to soak up a Bud Light: The cheese-filled breadsticks offer little more than salt, bread and goo, yet you want for nothing else. Pretzel bites are a toastier, deconstructed version of the Bosco stick with silken, Monterey Jack cheese sauce served on the side in a plastic ramekin. At the Lou, St. Louis favorites like pork steak share the menu with well-executed bar fare, including nachos. However, the reason to go to the Lou is the pizza, a wonderful rendition of St. Louis' own thin-crust, Provel-covered, square-cut contribution to the world of pie. The restaurant offers solid takes on a loaded veggie, meat lover's and a variety of single-topping pizzas, but if you're at a St. Louis-themed restaurant, the only way to do it is to go peak STL and order "The Lou." This ham-and-cheese pizza, inspired by the wonderful Gerber sandwich, uses a garlic-butter base in place of red sauce, then covers it with hunks of ham, gobs of Provel and a sprinkle of paprika. It's heavenly. 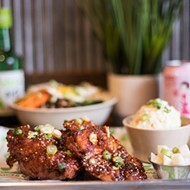 If the Lou Eats & Drinks and Mas Tequila Cantina are glimmers of life, the newest addition to Second Street, the fast-casual Kimchi Guys, may well prove a beacon. Like Willoughby and Zingrich, Kimchi Guys owner Munsok So has a history in the neighborhood, having opened the Landing outpost of his restaurant chain Drunken Fish in 2006. Even then, friends raised their eyebrows when he decided to locate to the area, but he didn't let that deter him. Instead, he purchased the building at 612 North Second Street with a plan to invest in the Landing for the long haul. "Everyone thinks you are crazy to do anything on the Landing," So laughs. "However, things started to turn around in 2016. They continue to. Now my restaurant friends are coming down here and saying, 'Oh my god, this is so cool — and you guys are busy.'" Kimchi Guys recently opened on the Landing. So's restaurant hasn't been open long enough to review yet, but it's a promising sign for any visitor. Seeing three restaurants all now open along the same strip of real estate confirms both So's vision and his friends' impressions. The fact that all three offer something different from the bar hopping and shots guzzling of yesteryear suggests the Landing is on its way to becoming something new, not just a pale imitation of its heyday. "There has been a need for quality food places here," So explains. 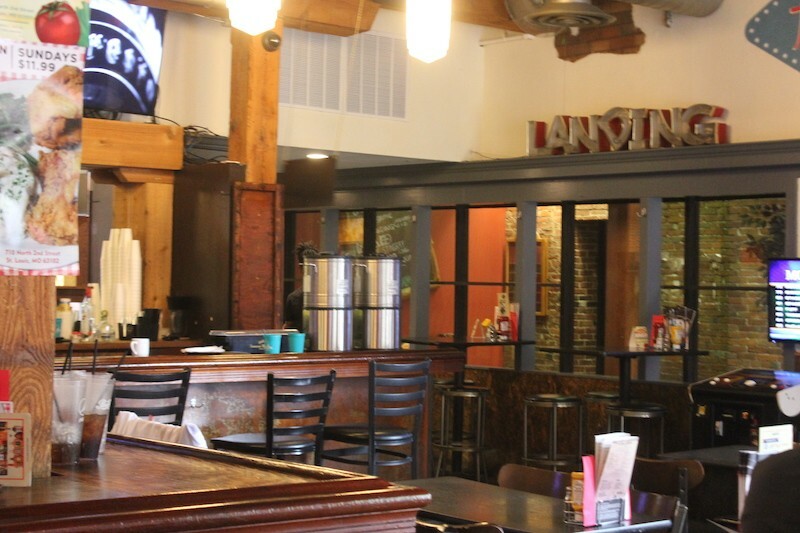 "I think the Landing has had the same sort of nightlife energy for such a long time, and now it needs to transform itself into something different than what it was recognized for in the past." Both So and Willoughby note the influx of businesses that have taken up residence in the Landing's office spaces, bringing with them hundreds of mouths to feed. They also cite the soon-to-open Pepper Lofts, a luxury apartment complex on First Street, as reason to be hopeful for the Landing's future. 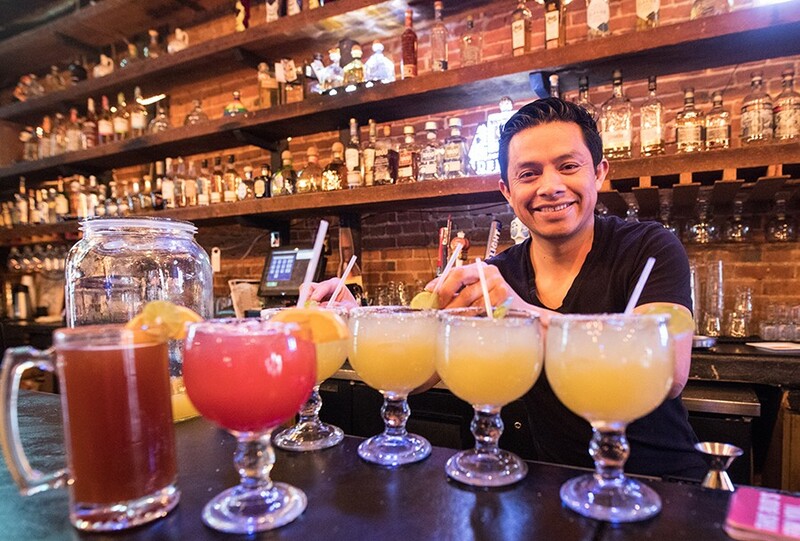 Mas Tequila Cantina's owners hope to fuel a new scene with a host of margaritas and unique tequilas. And they, along with Geminiano, say they see each other not as competition, but as complements. "The Lou and Big Daddy's bounce off each other," Willoughby says. "Everyone has different specials every night; it's almost like this big neighborhood. We all want this to be a place where people come, and we are so happy places like Kimchi Guys and Mas Tequila opened. Having more places pop up gives the push to make this area great again." They're not there yet, the restaurateurs acknowledge. But in a year or two, Geminiano asks, who knows? "There is a real community down here, and we are all helping each other," he says. "We're all in it for the long haul."